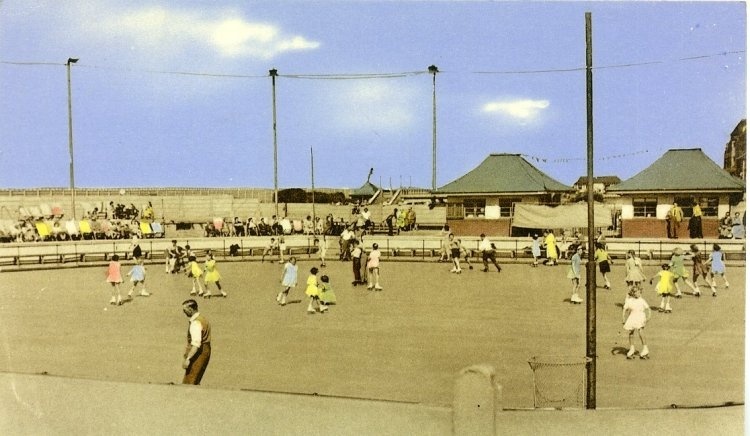 Redcar once had an outdoor swimming pool and paddling pool next to the existing boating lake. This area is currently being redeveloped for the Tuned In / myPlace centre, while this was happening I noticed a lot of concrete has been dug out of that area. Its possible these are the remains of the swimming pool, although I also have a recollection of some concrete steps leading into the ground in this area, so it could also just be an old drainage tank of some sort. Update : Some discussion below has pointed out the concrete was actually the skating rink, thanks to those involved for clearing that up. Vaguely remember the area being referred to as a roller-skate rink in the 1960’s which could just have been the concrete floor of the drained pool. The concrete excavated was the base and walls of the old skating rink. The swimming pools were to the West of the rink. In front of the old baths was a paddling pool which was filled in in the ’50s & made into a roller rink. Around this paddling pool was a full size elephant on rails that you could sit on top of – I can remember being really scared at about 3years old as it seemed very high. Does anyone remember it? Just come across the photograph of the old skating rink, brings back many happy memories. Was 3d to hire a pair of old metal skates, there was a counter where you could purchase sweets/drinks/crisps, this was located in the left of the two buildings in the photo. Every half hour or so the normal skaters would be asked to leave the rink area so that the better/faster skaters cold skate, sometimes a ‘Celebrity skater’ would grace the rink , seem to remember a young lady by the name of Irene Farthing ? think that was her name, anyway, remember being taken to the rink by my mum and auntie on sunny afternoons. Good memories.